Matt Magarian and his crew have begun on their second green at this William F.Bell designed parkland layout outside of Sacramento, CA in Fair Oaks. This club opened in the early 1950’s and has poa/bentgrass greens and bermudagrass fairways. North Ridge CC is also hosting an XGD Systems Field Day tomorrow morning at 10am for other clubs to stop by and view Matt and his XGD crew in action on a green here, as well as viewing the finished opened green of hole#1, that Matt completed this past Saturday morning. During the morning Field Day XGD President Geoff Corlett will also be giving a drainage seminar. So, please view this blog as an open invitation to come out to North Ridge CC tomorrow morning at 10 am to view a green under the knife. 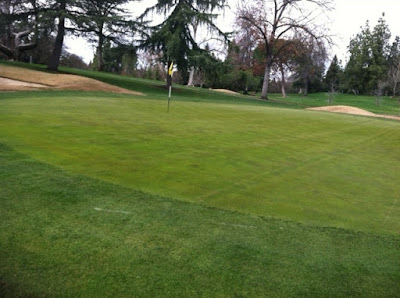 Once Matt completes the two greens here he heads to complete a green not too far away at Sierra View CC in Roseville, where the XGD team will be completing green there from Thursday to Saturday of this week. Please contact us at XGD if you can’t make tomorrow’s Field Day and perhaps you could stop by to see Matt at your leisure later this week.